KONAMI SF MOVIE SELECTION SERIESSPACE 1999. RESCUE EAGLE TRANSPORTER. The item is a pre-colored, high-quality detailed plastic(hard vinyl) scale model, about 11 cm in length. Condition: NEW with the separated tray, without the original box. FEATURES INCLUDE CERTIFICATE OF AUTHENTICITY SIGNED BY GERRY ANDERSON, PRESENTATION ACRYLIC DISPLAY CASE WITH BASE FEATURING A ETCHED BRASS PLAQUE WITH EDITION NUMBER. THIS ITEM HAS NOT BEEN DISPLAYED. EAGLE TRANSPORTER WITH PASSENGER POD. LAUNCH PLATFORM BASE. MACHINE TURNED AND HAND FINISHED ALUMINIUM ENGINE BELLS. EAGLE FREIGHTER WITH CARGO PALLET. LIMITED EDITION SET 1: BREAKAWAY. SIX NUCLEAR WASTE CONTAINERS. LIMITED TO ONLY 1000 WORLDWIDE. MACHINE TURNED AND HAND FINISHED ALUMINIUM ENGINE BELLS. Space: 1999 - Stun Gun. The stun gun used on Moonbase Alpha in the classic Gerry Anderson series Space: 1999. A solid resin body, four resin emitters and Stun / Kill selector. Space 1999 is made by Gerry Anderson Production. Space 1999 is a Gerry Anderson Production. Planning and Maker: Product Enterprise. High Quality Details. Do not miss the chance to get this item ! Space 1999 1/72 Moonbase Launch Pad resin model kit HUGE! This launchpad kit is still the best and most faithful kit that was ever made on the subject to date. Casting quality is pretty good considering molds have been around for years. KONAMI SF MOVIE SELECTION SERIESSPACE 1999. EAGLE TRANSPORTER. The item is a pre-colored, high-quality detailed plastic(hard vinyl) scale model, about 11 cm in length. Condition: NEW with the original box. This is a really Great model and depicts the famous Space 1999 VIP Eagle Transporter from the 1970's Gerry Anderson TV series "Space 1999" and appeared in the very first episode entitled "Breakaway". It's in new condition as can be seen in the photos. SPACE 1999 Eagle toy 1976 Mattel. Custom restoration. Rare version. Custom restoration. Rare version. Toy does not have gun, or gun rack. This is only 1 of a few in the world that look like this. 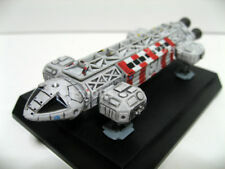 This item is from the Sixteen 12 Space 1999 1/72 scale Breakaway Episode Edition. It's in very good condition as can be seen in the photos. 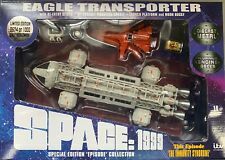 【MINT】SPACE 1999 LABORATORY EAGLE PRODUCT ENTERPRISE Gerry Anderson Aoshima. Space 1999 Eagle Laboratory Diecast Model Chogokin Gerry Anderson Aoshima Japan. 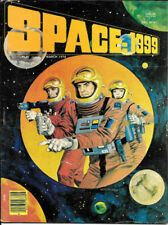 Space 1999 is made by Gerry Anderson Production. Includes 2 sets of 4 baffles each (enough for 2 Eagles). 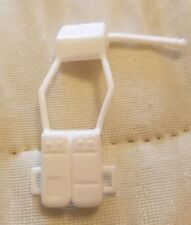 They will also fit Warp, Airfix, Imai, MPC or AMT/ERTL Eagle kits with little or no modifications. Assembly and painting required. Instructions included. Sales: Aoshima "Shin-Seiki-Gokin". Space 1999 is made by Gerry Anderson Production. Space 1999 is a Gerry Anderson Production. Planning and Maker: Product Enterprise. High Quality Details. Do not miss the chance to get this very rare item ! Alpha's Child 298-331. This a Booklet W/ 400 Cards. Force of Life 166-197. Black Sun 58-91. Guardian of Piri 256-297. Missing Link 232-255. 1 Staircase (3 resin parts and 2 brass rods). They will also fit Warp, Airfix, Imai, MPC or AMT/ERTL Eagle kits with little or no modifications. Assembly and painting required. Instructions included. Sales: Aoshima "Shin-Seiki-Gokin". 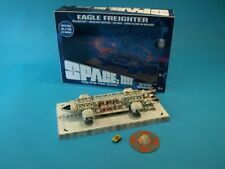 Enjoy Space 1999 Freighter Eagle ! Space 1999 is made by Gerry Anderson Production. Space 1999 is a Gerry Anderson Production. Planning and Maker: Product Enterprise. The two pictures showing what the item looks like out of the. Ok I downloaded off the internet so you could see. It's not the actual item (which has never been removed from box). Images of the cardboard box are of the actual item, still sealed, never opened. The Eagle, designed by visual effects maestro Brian Johnson in 1974, is the reconnaissance spacecraft in use on Moonbase Alpha in the British cult science fiction tv series Space: 1999. Manufacturer : Product Enterprise. Release date : 2006. Your happiness is our happiness. Osaka is a very good town. The Shinkansen, JR, a municipal subway are at Osaka Station, and the traffic is very convenient. The sculptors really went into a lot of detail on the exterior of this baby. However, Kenner's version blows the other one out of the water and it goes beyond just the closed cockpit. This thing doesn't look like a toy, rather a scale model of the actual vehicle. 1 Enterprise 1701 A 1/350 Scale unmade HUGE #. LOOKS WONDERFUL WITH OR WITHOUT SUPER SIZED ENTERPRISE USS 1701. 1701 A Polar Lights 1/350 Scale Model. Star Trek ~ USS Enterprise NCC-1701 A Polar Lights 1/350 Scale Model. Space:1999, which originally aired in 1975, featured the crew of Moon Base Alpha as they found themselves stranded on our moon as a nuclear disaster knocked it from Earth's atmosphere. Glue assembly, paint required (not included). Vintage SPACE: 1999 Refurbished WHITE EAGLE, Dinky, Meccano. Iconic Eagle beautifully restored in White / Silver colors with blue window panels on shuttle module. Awesome display model for a true fan! Going to miss this one very much! Space 1999 is made by Gerry Anderson Production. Space 1999 is a Gerry Anderson Production. Planning and Maker: Product Enterprise. 100％　Authentic, Very Rare! High Quality Details. - It usually takes about 3-7?. Material : Diecast. Model : LABORATORY EAGLE. There are yellow tints on the blister. Your happiness is our happiness. Size : 12" (300mm). The battery powered light bulb that illuminates the center console display is included, but I did not have a D size battery on hand to test it. The vinyl pad is worn at one corner from being folded and unfolded for play, as shown. I put USA. 25 Cent Coin (Quarter) next to it to give a better sense of scale. All complete and in great condition. See details for that on their web site. In Space:1999, the series’ 1st episode showcases Nuclear Waste Area #2 as one of the settings of adventure. A “plug & play” light kit is included to light all 8 lamp stands. It is compatible with the 22” Eagle Transporter model kit (available now!). Material : Diecast. Model : FREIGHTER EAGLE. Your happiness is our happiness. Size : 12" (300mm).